Devices can be the media for malware to spread and/or sensitive data to be lost or stolen. Device Control is required by organizations to protect systems and data. Video on how to implement device control to protect endpoint computers by allowing access to only specifically authorized devices. Device Control Made Simple, Effective & Affordable! USB-Lock-RP is a complete device control software solution to protect Endpoint Servers, Workstations & Laptops running Windows Operating Systems. It manages access of a broad range of devices that could be used to extract sensible information or infect your systems, such as USB removable storage, eSATA, Firewire and USB Attached SCSI drives, Mobile phones / Smartphones (MTP protocol), Portable devices, Smart Cards, Compact discs, and Bluetooth, IrDA, Wi-Fi transceivers, as well as badUSB devices that impersonate HID interface devices to attack endpoint computer systems or cause data loss. USB-Lock-RP Endpoint Device Control by Advanced Systems International: Protects ICS and corporate IT network computer systems & data assets from threats presented by unauthorized use of removable storage, portable devices, compact discs and wireless transmissions. Strong DLP Data loss prevention software to secure Network endpoints using NT5.1 to NT10 Windows Operating Systems(64/32 bit). Centralized Control over USB removable storage, Portable Devices, Removable Media and wireless adapters in Networks of any size. Includes functionality to Regulate portable storage USB and other removable media, Monitor USB Thumb drives, and protect data stored inside authorized USB drives by forcing AES 256 Encryption. Permanent use licenses, Software is delivered ESD personalized with your organization logo. Does not require internet to operate, giving organizations independent control. Information contained in your organizations network is a most valuable asset. To protect this value and network integrity operating systems default friendliness to portable storage needs to be controlled. Use USB Lock RP by Advanced Systems International, USB Lock RP endpoint security software Helps IT managers protect every computer in their network. Comprehensive block or allow capability uses device serial numbers to keep threats away while keeping authorized data transfer as easy as ever. 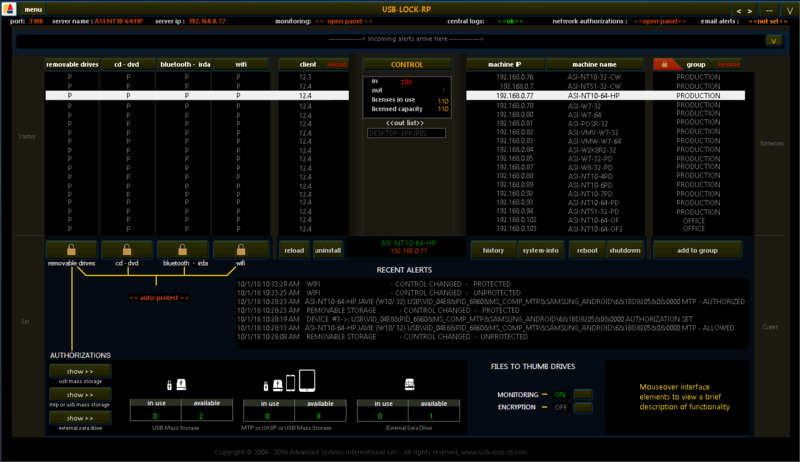 Get real-time alerts, monitor authorized devices and more. Enjoy control without burdening peripheral equipment. USB Lock RP offers complete up to date removable storage protection, including super speed storage USB, FireWire, and E-Sata interfaces as well as MTP, compact discs, and wireless transmissions. Personalized with your organization logo USB Lock RP will fit the professional environment you are looking for. Scalability set us apart, The CENTRAL CONTROL provides full functionality from one location. No matter how many computers your network has USB Lock RP will stand up and protect your data in real-time. Stay secure, ward off threats, and maintain your normal business data flow safe. USB Lock RP comes with permanent licensing, so put it to the test today!, DOWNLOAD THE DEMO to see USB Lock RP stand up for you. Learn more about USB-Lock-RP Device Control Endpoint Security Software to protect windows networks.